Mobile devices have become more powerful, but sometimes their size makes it harder to do things like type up notes, messages and more. ZAGG is helping those who need to use their phones in more of a laptop setting with the ZAGG Pocket foldable keyboard. I have used ZAGG products for a few years now. The Folio on my iPad has turned that tablet into a more powerful machine and I don’t have to bring my laptop to everything. That is where the Pocket comes in even handier – all you need is a pocket to put the keyboard into. The Pocket folds up into the size of a pencil case. 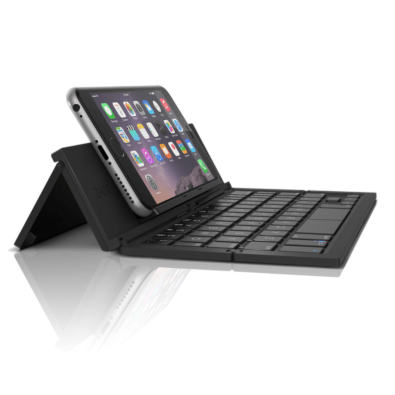 Unfold it to reveal a slightly smaller keyboard, stand for your phone, and kickstand to hold it at an angle. Bluetooth connection to the phone and you can start typing right away. While the keyboard can connect to anything via Bluetooth, the stand can only hold smaller items. An Android or iPhone, 7″ tablet or iPad mini. Unfold the keyboard to turn the power on. The Pocket has a 950 mAh battery claims it can offer 2 years of use from a full charge. I have only had it a week and it did just fine so far. If the battery is low, the LED light will show red and a full charge the LED will show green. The keyboard is 85% the size of a regular sized one. The fold in the middle made for a bit of bounciness, so a standard typing style was a lot harder to accomplish. I found myself missing keypresses more than missing the keys. The smaller size was not as much of deterrent, though. Overall, this is a great option for someone that doesn’t want to carry a tablet or netbook with them. The keyboard will allow for you to type anywhere you need to type notes, email, SMS messages and more. Those flying a lot may like the compactness and ability to type on a tray table.